Straight Outta Mayo: Kenny Finds his Mojo - Charley Brady - Opinons; My Own. This was written a couple of weeks back. I don’t think that anything has really changed, apart from Mr. Martin clarifying the clarifications on the U-turn that’s not one. I am amused, though, at Sinn Féin’s Louise O’Reilly commenting that when it comes to water charges, Fianna Fáil has ‘more positions than the Kama Sutra’. Considering what they did to the country the last time they were left in charge, it seems like a rather apt piece of imagery. This piece appears in Chicago’s ‘Irish American News’ for October, 2016. What a week! 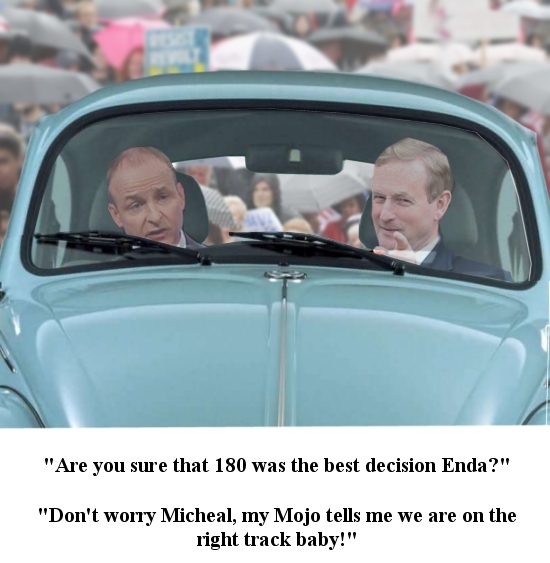 First of all Dame Edna Kenny gets his mojo back; and then Fianna Fáil makes a complete turn-around on water charges — which isn’t really a U-turn at all, according to no one but Micheál Martin. I swear, between the lot of them, they have my head more bent out of shape than usual – and that’s really saying something. Whilst the Fine Gael Party were fretting, sweating and wondering what in the name of all that’s holy AND unholy they have to do to finally get rid of their Beloved Leader, Kenny somehow slipped off the straightjacket, escaped from his handlers and was let loose to actually come out with something that was unscripted. And let’s be honest, we know that NEVER ends well. Now in fairness, the episode with the air guitar shouldn’t really surprise anyone, since Enda has history in seeing things that remain undetected by anyone else. This is the Taoiseach that (according to him) people call up in the dead of night to ask if he’s made a mistake with their wages – by overpaying them; here is the hero who once spoke to a water protestor who was carrying two pints in each hand; it is the man who once sat on a bench and shared a heart-to-heart with a homeless person who never existed. The madness is strong in this one, young Skywalker. Of course, given the latest theories on Mrs. H. Clinton we must now ask the question: is Enda Kenny using a body double that is letting him down? Because, Heaven’s wept; could this guy really GET more embarrassing? I mean, it’s not exactly a surprise to find that Kenny has no interest in history…but ‘mojo’? Poor oul’ Enda. It was a master plan, so it was; but within a mere few hours that terrible yoke, Micheál Martin had up and stolen his little bit of thunder. Now of course, most of us were still laughing our heads off at Street Enda and his Mojo; but our cough was fairly softened by Martin and the U-turn that is not. After all, this is Micheál Martin, the man who said that we had “an obligation to pay” the water charges and happily confirmed their suspension before going on to announce that “the bottom line is that we’re consistent people should uphold the law”. And all that guff didn’t come out of him years ago. That was in May. Of this year. Mind you, look at that wording. Very slippery of you, Clarice. In fact, this guy could nearly be a politician. At least he’s consistent in his inconsistency. “It’s not a U-turn. [At this point I like think that he started to stamp his tiny feet, screw up his eyes and yell: ‘It’s not! It’s not! It’s not! I’ll scream and scream until I’m sick!’] We’ve said from Day 1 prior to the election and our submission is very consistent with our general election position. Listen, that’s what he said. I’m only the messenger. It was at this point that I tried to remember if we were still at war with Oceania. I knew that we HAD been at war. Or had we? Perhaps we had NEVER been at war. And was Orwell really holding up five fingers? I could only see two but he assured me there were five! And in another part of the globe Pat Hickey languishes in an apartment in Brazil whilst the police there do the job that the Irish forgot to. And it all gets played right down here, with some news sites even refusing comments because Pat is one of the Golden Circle and what are the peasants at after all, wanting to read about their betters? And with the dodgy NAMA dealings in Northern Ireland we say thank goodness for the internet and the BBC because there’s a virtual Irish news blackout every time Mick Wallace goes to open his mouth. And now this morning we have some unelected chancer all the way from Malta lecturing us on the *sigh* water charges again – and you can be damned sure that Kenny will be tugging his forelock like a mad thing. No better man than Enda, as soon as he hears the word ‘Europe’ mentioned. It’s all right, everything is all right; the struggle is finished. I’ve won the victory over myself. Now for ye, Enda. Where are you with your mojo after that?